Speed. Power. Noise. Ice. And a near complete and total lack of visibility. This is why the 2016 Chevrolet Camaro SS is both the best and the worst car for driving in a blizzard. And I wouldn’t have it any other way. This past weekend, the skies unleashed a torrent of powder onto Jalopnik’s secret bunker, with over 26 inches accumulating in less than 24 hours, which was good enough for a new record. Knowing the forecast, we really had only one option. A bright-red Camaro, in SS trim with a 455-horse V8, sounds like it’d be the worst car for a blizzard. Traditional blizzard cars tend to involve a navy blue Subaru Outback, or a 1990s Toyota 4Runner which, despite sitting on the fattest stock tires this side of a combine harvester, can get deceptively slippy thanks to its all-season rubber compound. Or something on trax. But ours wasn’t just any Camaro SS. Ours was on super-grippy Pirelli Sottozero snow tires, which aired a sense of invincibility. A hilariously false sense of invincibility, as we were soon to learn. Maybe we’d bit off more than we could chew. Maybe there was too much snow. Maybe we should’ve just stayed in, and started drinking wine like everyone else seemed to be doing. As the flakes started to fall, however, we weren’t entirely sure what we were going to find. There were just too many wildly unknown factors. Rally drivers in the Rally Sweden regularly pound through the toughest snow-covered trails, but they have special tires with super compounds, and all wheel drive, and whole teams of experts, and Mads Østberg. We had none of those things. It was just my esteemed colleague, Raphael Orlove, and me. My winter driving track isn’t exactly stellar (despite growing up in the Northeast), and Raph’s could be better. And despite knowing that winter treads are wildly better than all-wheel-drive, we usually mean in the context of throwing a pair of sneaks on your beater BMW and being an idiot in a parking lot covered in a solid less than six inches of powder and ice. Not gingerly taking a car we decidedly didn’t want to crash midway through another storm of the century. As it was, our plans for a full video had fallen through as the public transit system began to encounter problems. The snow had gone higher than the car’s ground clearance. The roads themselves were supposed to be shut down. But the second we saw the streets covered in the white stuff, we knew destiny awaited. The only choice was to take her through and encounter a landscape transformed. It sat there, peering through the six or eight or ten inches that had already fallen, looking unlike anything else on the block. 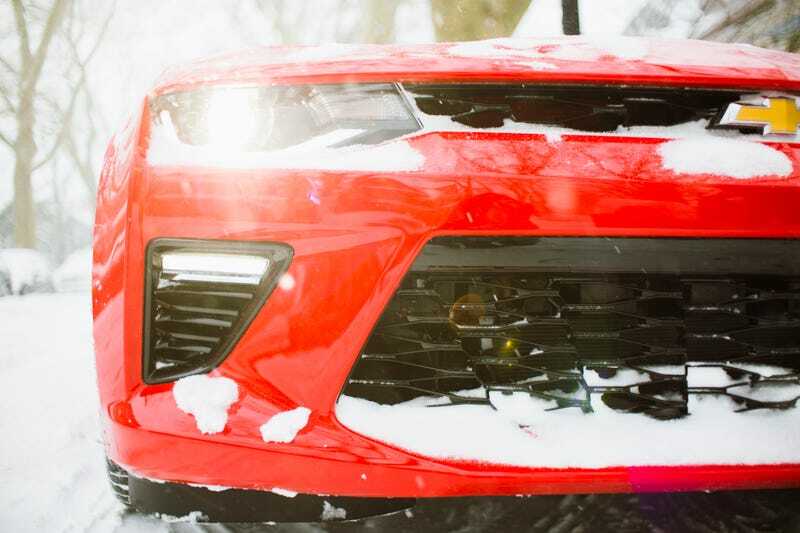 The gentle sweep of the snow and wind had exposed the real design Camaro’s aerodynamics for the world to see. Unlike the chiseled hindquarters that the car’s stylists would trick you into believing actually exist, a smooth shooting brake had emerged, sculpted out of the environment around it. That was really the only sign we needed. We weren’t going to set any track records through Brooklyn that day, but we were going to have way more fun than we had any right to. I wanted the exhaust to belt out an opera when I started it, a siren call to the world that we had seen winter, and we would not be cowered. We set about clearing the car from as much snow as we could. I, equipped with a brush and scraper tool, and Raph, equipped with what looked to be a shvoel from a dollar store. What those with weaker constitutions might say we needed at that moment was a massive snowblower, and a proper jet-powered melter. But we didn’t actually need that. For one, we were inspired. For another, Minnesota exists, and we can’t allow them to laugh at us. And as the wind picked up, blowing the snow all around us and inducing near-white out conditions, the Camaro stood out as clear as a sunny day. It’s that I’d left the car in Stealth Mode, which keeps the exhaust valves shut, bringing the mighty V8 bark and bellow to a constant whisper, when I parked it. I wanted the exhaust to belt out an opera when I started it, a siren call to the world that we had seen winter, and we would not be cowered. It turns out, I did not leave it Stealth Mode when I parked it. I had left it in Track Mode, like a good nutjob, and a resonant roar hit us as soon as I hit the start/stop button. Instead of our courageous siren call, I’m sure we sounded like beautiful idiots. Getting in, I instantly realized what a silly notion it is for someone to say that any other car’s interior is ideal for winter. I don’t want tweed on my winter seats. I don’t want plaid. I want bright red leather, a seat heater on my backside, a steering wheel heater for my hands, and garish, wonderfully cartoonish ambient interior light strips that I could change from cool ice blue to bright red to keep me warm, if I saw fit. At that moment, we really didn’t want to be anywhere else. But having a car like this in the snow is really all just a bad joke and a letdown if you don’t drive it at all. “It’ll be easy,” I thought. It had winter tires. It had a snow/ice mode, and traction control and electronic stability programs. It wasn’t easy. Our original plan was to get to a big parking lot somewhere and do nothing but the best snow donuts, but this was almost better. The traction control wasn’t happy. Anything more than the slightest touch, and it dropped the engine down to idle. So the slightest touch it was, and we were finally moving. Or rather, when I say “we,” what I meant was “I,” as Raph had stayed outside the car both to snag me driving away for the camera, but also to make sure I hadn’t inadvertently completely turned the car’s nannies off and promptly sent myself into the nearest tree. But once Raph was in the car, we found that actually driving a 455-horsepower V8 Camaro in deep snow wasn’t so much a beautiful drift-fest, as we hoped it would be. It was more just deeply strange. The previously tiny, communicative flat-bottomed steering wheel now felt useless and disconnected at times, completely different from how it was on dry asphalt. Instead, you just sort of vaguely turned it, punched the gas pedal, and let the throttle turn the car. Turn the traction control and ESP completely off, and it felt more like a terrified cat trying to walk on water. Everything just ended up sideways, and countersteer became the only type of steering you needed. Which was hilarious. Our original plan was to get to a big parking lot somewhere and do nothing but the best snow donuts, but this was almost better. Our route wasn’t determined by where we wanted to go. It was a complete collaboration between the snow beneath us and the car around us. The driver had nothing to do with that level of decision making. We slid, we dodged drifts that threatened to beach us, and we prayed that we wouldn’t get stuck in an intersection, blocking the few cars on the roads and the plows that needed to actually do work. We were just along for a ride. The car was both terrible in the thick of it, and an absolute joy. The Camaro was a triumph of the irrational over the practical. It was a celebration of brute force and bright red paint over Mother Nature and her hellacious frozen fury. As the clouds loomed overhead, we were sure that snagging the bright red exhaust-spitting beast was either a great idea, or a great idea. But truth be told, it really was one of the best worst ideas we’ve had in a while.